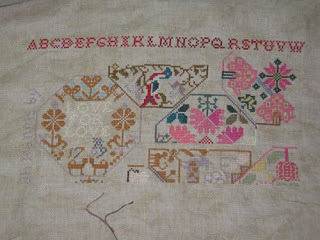 Wow I just am enjoying stitching this sampler so much I have stitched on little else for 2 weeks. I have finished 3 pages now and have 12 more to do. 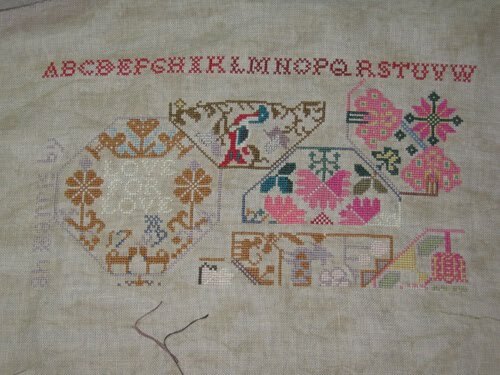 I just can't remember when I enjoyed stitching something this much. Actually I would have been onto page 4 by now except that the frog has been at the house. I think that I must have thrown it out with the 2 sandgropers that Milly decided to bring in last night. So with out further ado I present you the first 3 pages of SH.